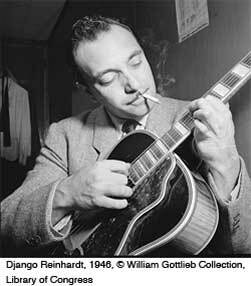 Originating in the suburbs of Paris in the 1930s, this distinctively energetic style of jazz was created by the legendary Django Reinhardt, who played with fellow gypsy musicians in Parisian jazz haunts during the 1930s and 1940s. Reinhardt grew up in a caravan in the Parisian suburbs and famously lost the use of two of his left-hand fingers in a fire. Despite doctors saying he would never play guitar again, the paralysis of his two fingers instead led to his invention of Gypsy Jazz (or Jazz Manouche as it’s known in France), a new jazz style incorporating three-finger chord structures and smooth, rippling melodies. It was then handed down through the generations of Manouche gypsies via oral methods, as most of whom, Django included, could not read music.